As you know that apple is upgrading its operating system to iOS 8 and there are already lots of things and features of that OS has been rumored before. The actual OS is not yet been announced for the users. However its beta's versions was released which were for developers i.e only for testing purposes. After the release of that beta version, some features are cleared and few more comes to know about. As there are lots of features that are being discovered yet. But here we will be going to highlight those features which are more favourable and are cleared the more. 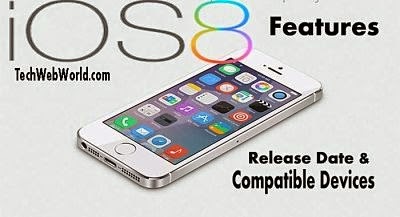 It is saying that apple is going to upgrade its operating system from iOS 7 to iOS 8 in the next upcoming months. but as you know apple is a bit slower in these types of upgrading OS also the fix date is not yet clear. But since we know, they already announced their two beta versions (and the third is saying to be on 8th july) for developers which shows that they're going to release the original upgrade soon. Below is the list of devices that will get iOS update after its release. Unlike apple iphone 4 The iPhone 4S, 5, 5S, 5C will be compatible with apple's new version of OS. In case of iPad Mini, iPad mini original and iPad mini 2 retina display. iPad Air, iPad 4th Generation and iPad 2 are the phones that will be supporting the new iOS 8. This features in the latest version of apple's OS will make the messaging more efficient. Actually, when you're typing a message a suggestion or prediction bar appears and predict the whole word for you when you type one or two letters. So we can say that this function will let us to send text messages faster than before. This improved auto-correct technology is making the predictions from your activities from different apps & messaging you sent to your contacts in past. Also it looks at your current activities to make predictions in the future. This feature was already included in Android's OS update, but now the apple is coming with it with its new upgrade, the feature is that user can get notified and preform a task while he's on another app without leaving the current app. For instance, A user can reply to an SMS without exiting the current app but just by pulling down the notifications at the top of the screen. You can also do the same on the lock screen and type to reply. Users of any device or Operating system expecting a user-friendly and more efficient interface. and I think the apple's new OS update coming with efficiency. With iOS 8, you can access people just by double tapping on the home button and you get faces of mostly contacted people so select a face to get communicated with him in the form of an available communication i.e Chat, FaceTime or FaceTime voice etc. The new iOS 8 comes with an enhanced email functionality, You can delete or reply to an email just by swiping to the left. With a bit harder swipe you can easily delete the message itself. There at the messanger, you will find a camera button by clicking on it, you'll have either to capture an image or record a video (using the front or back camera depends upon your last activity with camera) and then can send it to your contact. Messaging system has improved the more, one of the features includes that you will now can share your current location with others directly. It may be you want to sent to an individual contact or share in a conversation. Lots of improvements discovered yet in messaging point of view. Leaving/Muting from a conversation is one of the coolest features of the new iOS 8. Another awesome feature is voice chat which means that now you can send & receive voice messages. Received voice message can be played even you're on the locked screen, what you've to do is to move your phone near to the ear and listen. A downward swipe will let you access to the spotlight either from the lock screen or everywhere in the iOS. This feature also appears in the current iPhone but now it will give you some suggestions too relating to things that are not stored on your device. The suggestion are relating to News, Wikipedia, Nearby places, iTunes store music, movies, iBooks store, Suggested websites etc. This feature is one of the most exciting feature which is specialized for those users who own multiple apple devices to associate their devices.This feature connects your devices with each other. For instance, you've Mac and your iphone device connected & you're working on your mac, in that particular time, if you received an sms, you will be notified of that on your mac's screen too, so you can even reply to that message directly from your mac. In particular, you can also make calls from your mac while your mobile device is connected to mac. This feature is also for those who has multiple apple's devices. The handoff feature will let your share data between the two devices more quickly. This is to let you drag & drop a file between mac and iPhone using Wi-Fi network. Few features related to photos & camera are included in the new iOS upgrade but from all those, photo editing feature is more useful and attractive. Photo app has the capability to edit your photos that your opened just by the thumb gesture. Favourite photo is also a good to see feature in new iOS 8 that let you make a photo favourite with one touch. That's not the end of the coolest features new iOS 8, in order to minimize the post size and don't let you get bored, we highlight the most attractive feature of apple's new OS upgrade below. Widgets - Re-arrange, remove or add more. So dear readers, I hope you liked our post and you got informed of the new upgrade in the OS from apple. We tried our best to provide informations useful for you relating to that topic. Now please do share this post on your social profiles and do a comment on this post and let us know whether you liked our post or not!